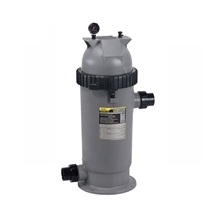 The CS Filter line utilizes single element cartridges designed to provide the same great filtration as the Zodiac Large Tank Filter series in a compact body. The cartridge element on the CS is easily removed, making it simple to clean and care for. The CS filter is just over a foot wide, making it the perfect choice for small equipment areas.